For this post, I’m going to provide step-by-step instruction for those of you interested in creating network graphs using Gephi. 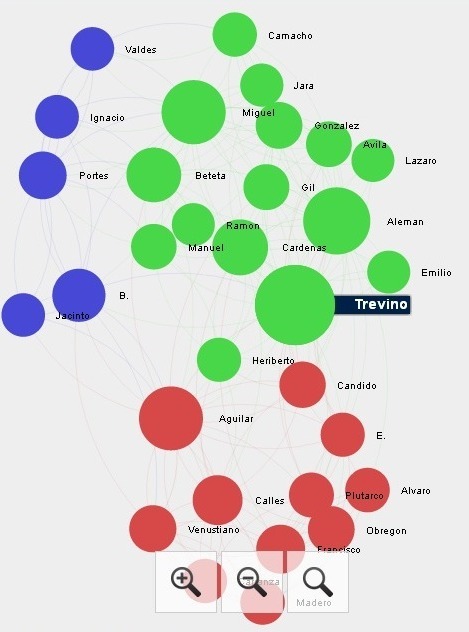 Certainly there is other open-source software available for visualizing social network and textual data such as Pajek (this website could use a serious design update), but at the time of this post, Gephi 0.8.2-beta has some significant advantages. 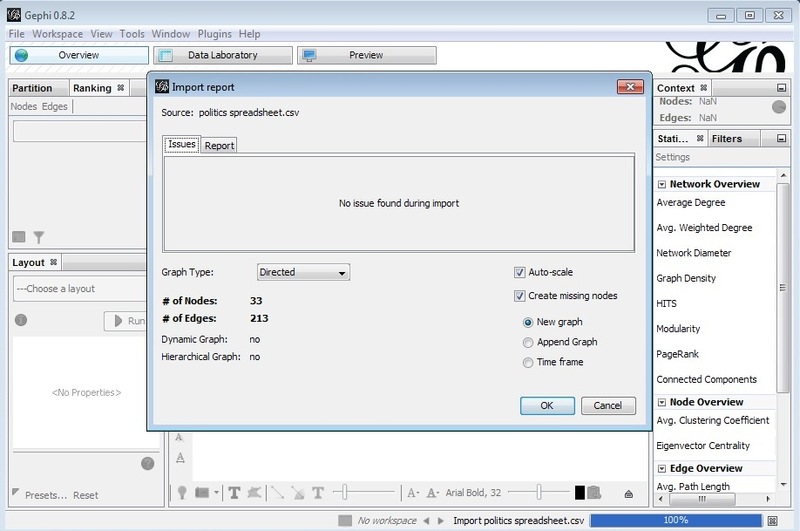 Software such as Pajek allows you to save your project file as a .bmp, .png, or .svg, but Gephi allows you to save your graph image as a .pdf. Additionally, Gephi’s most significant advantage over the competition comes from the inclusion of the sigma.js plugin, which uses the HTML canvas element to display static graphs like those generated in Gephi. This is a massive leap forward for sharing graphs generated in Gephi, as now they can be uploaded directly to your server/website using an FTP file manager such as FileZilla. 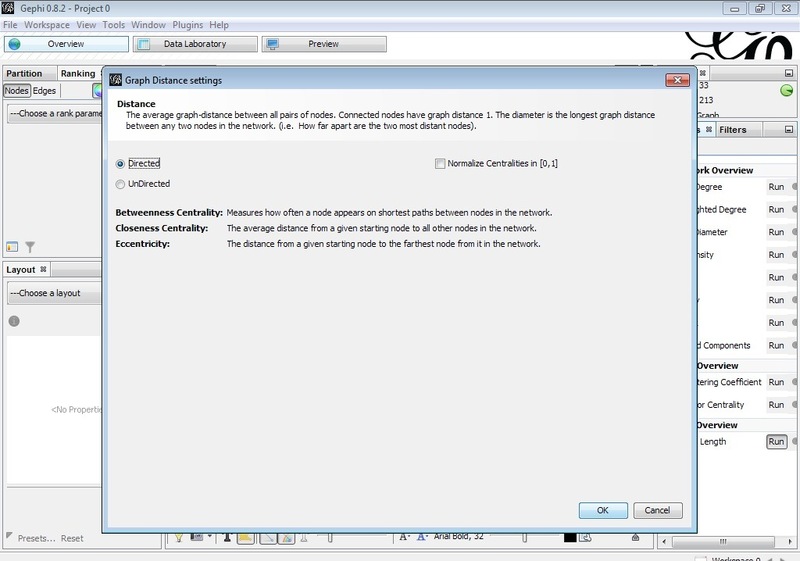 To interact with the graph rather than view it as a static image used to require downloading the specific, proprietary program file containing the graph from its creator, then downloading the specific software to open the file. However, with the sigma.js plugin, interactive graphs can be displayed and shared instantly via a simple web address. To begin the process of creating and sharing your own network graph using Gephi, I’ll break the process into a series of simple steps. I think these instructions will be useful to those of you starting out, as a simple, step-by-step “Gephi for Dummies” manual simply doesn’t exist at the time of this post, something that I wish I had when I first started working with the software. Gephi has a “Quick Start” guide here which is worth a look, but it leaves much to be desired as a basic guide for a novice user. The following instructions which I’ve created owe much to the wisdom and experience of Jason Heppler and Rebecca Wingo, graduate school colleagues who provided a lot of assistance during my trial and error process of figuring out Gephi’s software. 1. Download and install Gephi from their website. 2. To download and install the Sigma.js plugin, open Gephi. Click on the “Tools” tab and click “plugins” from the drop-down menu. 3. 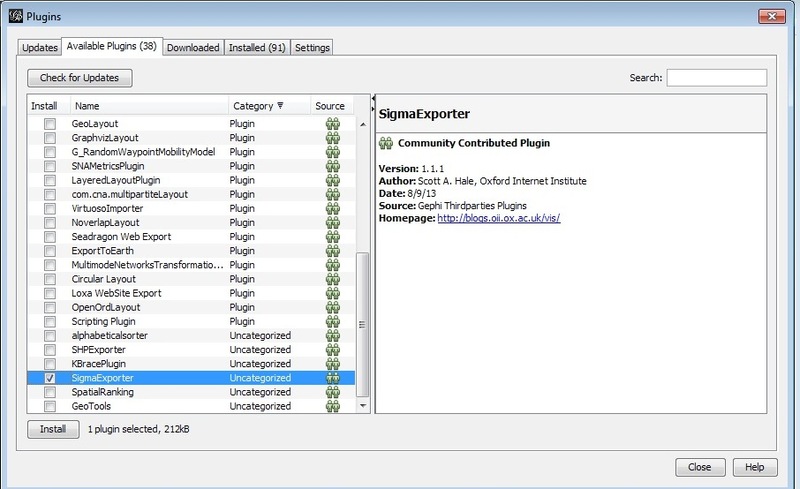 Click on the “Available Plugins” tab and scroll down nearly to the bottom of the list to find the “Sigma Exporter” plugin. 5. 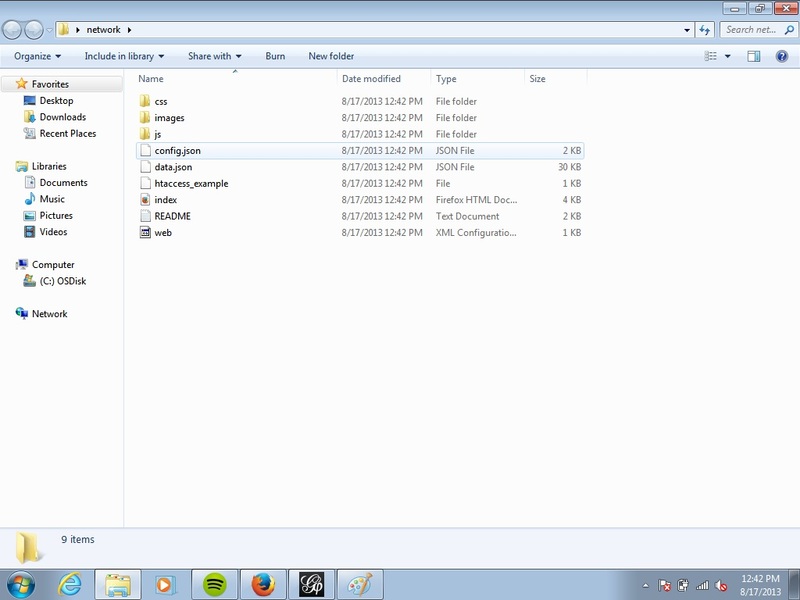 Once the plugin is downloaded and installed, close and re-open Gephi to complete the plugin installation. 6. 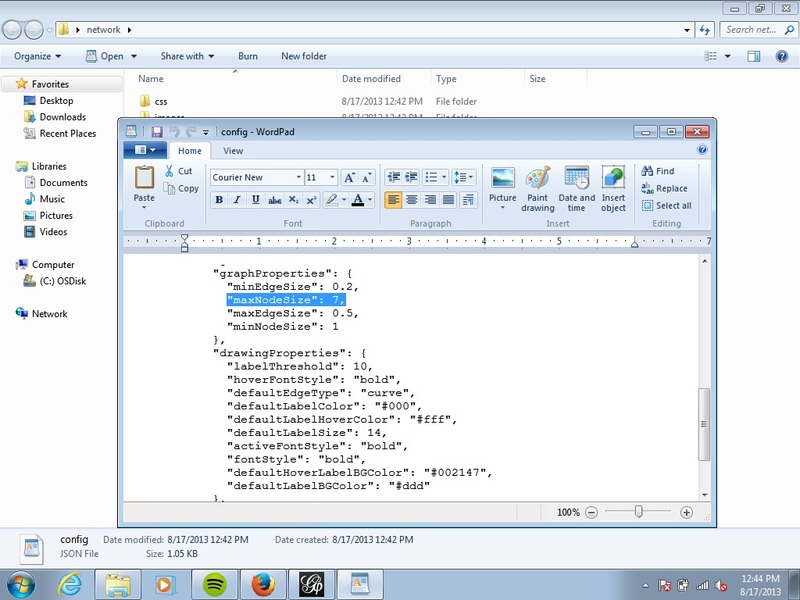 Now it’s time to format your data for importation into Gephi. 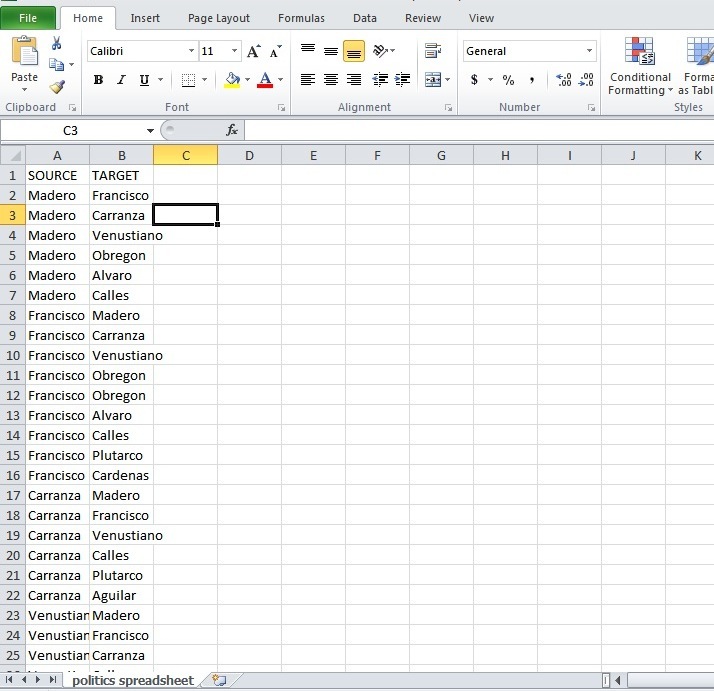 Using Microsoft Excel, create a two column data set. The specific format for the data needs to be divided into one column as SOURCE and the second column as TARGET. (See example screenshot below). 7. The SOURCE column on the left determines the number of nodes your graph will contain and the TARGET column will determine the number of edges (or connections) between nodes. Repeat the node-edge/source-target pattern in these two columns for each connection between nodes you wish to visualize. 8. Once you’ve entered in (or hopefully imported) your data and saved it as a .csv file, you’re ready to import the file into Gephi. 9. Open Gephi, click the “File” tab, then click “Open” from the drop-down menu. 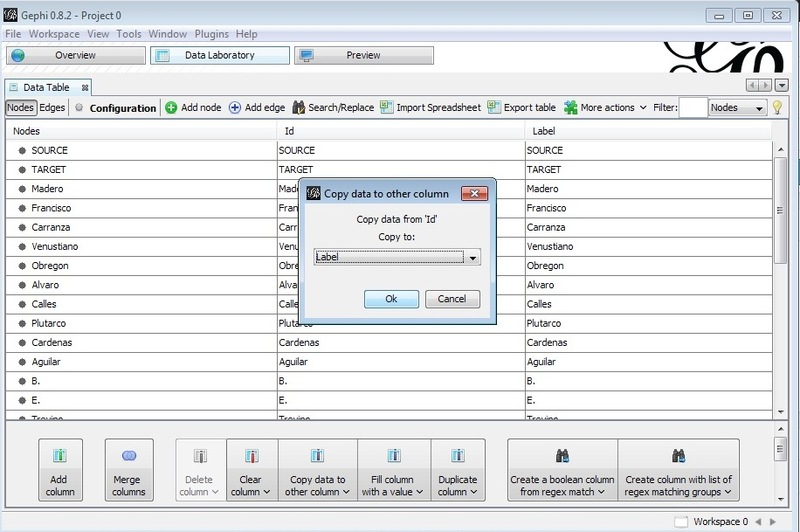 Browse for your .csv file, and click the open button at the bottom of the window. 11. To label your nodes in the graph, click on the “Data Laboratory” tab. 14. Now click on the “Overview” tab to tinker with your graph’s spatial/visual layout. 15. Click on the “Choose a layout” tab on the lower-left part of the window to determine how you want to display your nodes and edges. A popular choice is either of the “ForceAtlas” templates, but I’d recommend tweaking the value of the “gravity” input to expand/contract the spread of your nodes to your liking. 16. At this point, you should be able to see your network graph on the “Overview” page and can choose to export your graph as a .pdf or as a Sigma.js template. 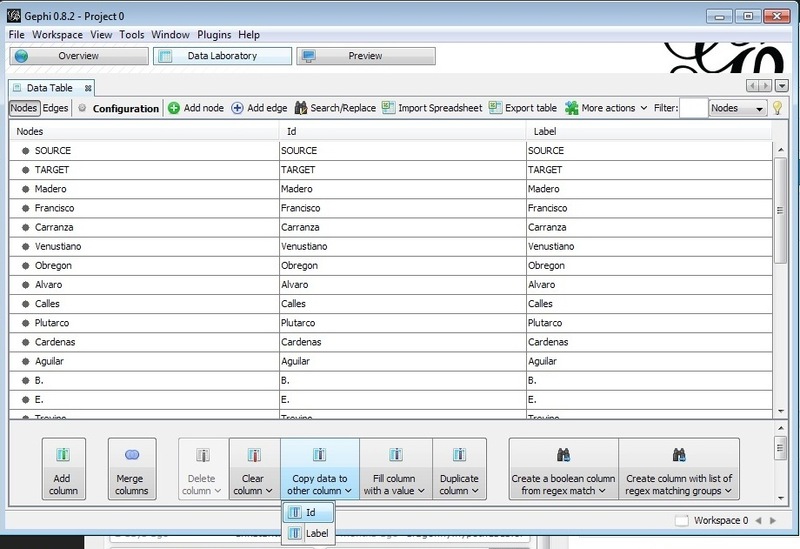 Click the “File” tab, scroll down to “Export” and select your preferred format for exportation. If you choose to export using the Sigma.js template, Gephi will create a folder containing files ready to be uploaded to your server/webpage. If you want to view the graph in a browser, click on the “index” file in the folder. 17. (ADVANCED) For those of you who wish to further tweak your visualization, you can customize your node colors and sizes by linking them to particular data attributes. 19. To color code your nodes by cluster and to emphasize the significance of particular nodes via node size, you’ll need to run at least one of several statistical analyses, which are located on the right side of the screen. 22. You can link any of the attributes from the “Choose a rank parameter” tab to node color, size/weight, and labels, so there’s a great deal of customization options available to you. 23. Once you’ve established the link between your nodes and your attribute of choice, you can adjust the min/max size and color of your nodes to further customize your graph. 24. This is as far as I’ve gone with Gephi, so I’ll end here with a couple final troubleshooting tips after you’ve exported using the Sigma.js template. One issue I had during my first project was that in Overview, my labels and custom node sizes showed up fine, but upon exporting the graph, all the nodes were the same, tiny size and had no labels. To fix the label issue, lower the “labelThreshold” value in the config.json file to assign labels only to nodes equal to or above a certain weight. Again, save the file once these changes are made, and re-open your “index” file in your browser to view the results. This screenshot is equivalent to the level of interactivity you can gain from viewing the graph as a .pdf, a static image. However, with the aid of the Gephi.js plugin, you can view a fully interactive version of the graph here, complete with clickable nodes containing a variety of attribute data. I hope you find this tutorial useful, and I look forward to seeing your future projects using Gephi. Stay tuned for more mapping and network graph projects I’m churning out this fall, and feel free to contact me at r.jordan@colostate.edu if you have any questions. Great post! Looking forward to try it!